It’s not everyday you will see the Grand Master of the BC and Yukon Freemasons, make a personal house call in full regalia. But in the case of Brother Roy Crosina, an exception was made. 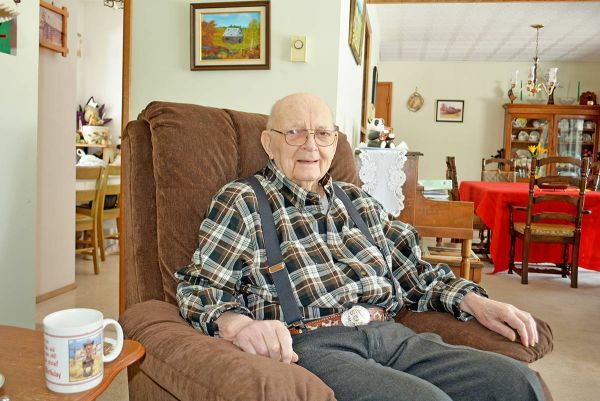 Roy, 88, has been a Freemason, and a member of Williams Lake Centre Lodge #113, for the past 64 years. He went into the Masons because his uncle and grandfather were members and that made him interested in the organization, his wife Shirley said. “Roy liked what they did and was really supportive of the care car the Masons have that transports patients,” Shirley added. Unable to attend the local Lodge to receive the recognition for his long service to the craft, the Grand Master did not hesitate to go to him. So on the morning of March 24, 2018, the Grand Master, accompanied by the Grand Marshall Mark Donaldson, — the current District Deputy Grand Master Cliff Cawley, a long time member of Centre Lodge Alan Boyd, and the current Worshipful Master John Tauber, paid Roy and Shirley a visit.